Tripoli: Libya’s interim rulers on Monday elected a technocrat and businessman to head a transitional government as NATO ended the air campaign that played a major role in ousting dictator Moammar Gadhafi. Abdel Rahim al-Keib, a native of Tripoli, was elected prime minister in a public vote carried out by the members of the National Transitional Council (NTC), an AFP correspondent reported. 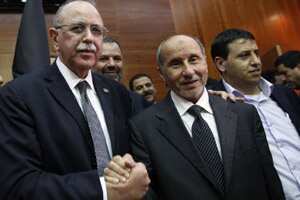 Libya’s newly elected Prime Minister Abdel Rahim al-Keib (L) shakes hands with National Transitional Council (NTC) chairman Mustafa Abdul Jalil at the end of a public vote in Tripoli 31 October2011. Reuters. “This vote proves that Libyans are able to build their future," NTC chairman Mustafa Abdel Jalil said after he voted. Keib, is both an academic and a wealthy businessman, who spent decades abroad as an opponent of Gadhafi before joining the pro-democracy revolution that overthrew him. “The main aspects of his programme were the stability of the country, of course, the security file and the military file, which will be under the control... of the interior ministry," said Fathi Baja, the NTC’s head of political affairs, after a presentation by Keib. “He also promised to provide for the basic needs of the Libyan people." “At midnight tonight, a successful chapter in NATO’s history is coming to an end. But you have also started writing a new chapter in Libya’s history," he told a joint news conference with Abdel Jalil. The visit came seven months after Western powers fired the first barrage of missiles against Gadhafi’s forces in an air war that played a major role in ousting the veteran dictator. The no-fly zone and naval blockade, enforced by NATO since 31 March , ended a minute before midnight Monday Libyan time (2159 GMT), as stipulated by a UN Security Council resolution last week that ended the alliance’s mandate. Operation Unified Protector was terminated even though Abdel Jalil had asked for the alliance to stay until the end of the year, warning that Gadhafi loyalists still posed a threat. But NATO deemed that civilians were safe from attacks after the new regime declared the country liberated following Gadhafi’s death and the fall of his hometown of Sirte on October 20. The NTC chairman hailed NATO’s crucial support and the precision of its air strikes. “The NATO operation in Libya was successful in a great way... It was very accurate in the way that civilians were not affected. I think the people of Tripoli testify to that," he said. “(But with) no NATO troops on the ground, I don’t foresee a major NATO role," he added. “It’s now for the United Nations to take the lead of the international assistance to the new authorities in Libya." Western air strikes helped tip the balance of power in Libya’s conflict, preventing Gadhafi from crushing the revolt that erupted in mid-February. While NATO has steadfastly denied targeting Gadhafi during the campaign, it was an alliance air strike that hit his convoy as it fled Sirte, leading to his capture and killing. Rasmussen insisted NATO did not know Gadhafi was in the convoy. “No, we didn’t know. Gadhafi was not a target of our operations. We hit legitimate military targets and an armed convoy is a legitimate military target because it can constitute a threat to civilians," he told AFP on Monday. Rasmussen also said NATO had no confirmed civilian casualties caused by its operations.